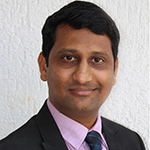 Abhijeet is one of the founding Partners at Stratjuris Partners. He has several years of experience in Intellectual Property domain focusing on Patents and trade. He is a Software Engineer and has obtained Bachelor’s degree in Information Technology from University of Pune. Abhijeet specializes in advising on strategies for Patent protection and preparing and prosecuting Patent applications with a focus on Software/IT, Mechanical, and Electrical & Electronics industries. Abhijeet has received advanced training for Patent Prosecution and litigation from US, Germany and British law firms. He has an extensive experience in Patent Searching, Drafting, Filing and Prosecution with Indian & overseas Patent Offices. Further, he has assisted clients to file numerous patent applications and assisted in many patent review cases, patent invalidation cases, transfers of patent rights, and a wide variety of intellectual property disputes. He is also expert in Design and Trademark matters. Abhijeet not only has extensive knowledge of the IP laws of India, but also is familiar with the Patent and Trademark laws of Europe, the United States, China, Japan and Australia, which helps him to develop global IP management strategies for his clients.